We all know how dead skin cells keep accumulating that contribute to skin problems like black heads, blocked pores, and the likes. Therefore, getting rid of those unnecessary dead skin cells is essential for maintaining healthy skin. When your skin's natural exfoliation process slows down giving way to signs of aging it is imperative to start caring for your skin from an early age to prevent skin damage. The Mirah Belle Dead Sea Salt Exfoliating Soap expels those dry and dead skin cells giving your body a smoother and softer appearance. Dead Sea Salt: We have all heard of the Dead Sea famous for its high salt content. The water is very, very bitter! However, the salt manufactured from this Sea has a truckload of minerals, which are excellent for the skin and hair. Therefore, it is used as one of the main ingredients in many skin and hair products. 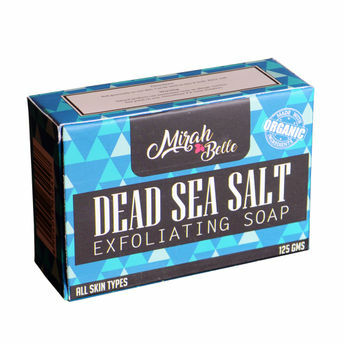 Dead Sea Salt boosts skin hydration, eliminates skin roughness and redness, and keeps the skin well moisturized. Its detoxifying properties helps to clear the skin pores, and it is beneficial for exfoliating the skin. It has anti-aging effects, and it works to prevent skin allergies as well. The salt also helps to keep acne at bay. Fragrance Oil: Also called manufactured scents, fragrance oils are basically essential oils diluted in some other carrier oil. These fragrance oils can also be created artificially, which are then used widely in various cosmetics, candles, perfumes, bath soaps, and other products. One should be careful while choosing a fragrance oil when making skin products, as it should be safe on the skin. The fragrance oils work to give your skin an aromatic experience, and leaves you smelling like a diva! Because of its high concentration and strong-smelling power, only a drop or two of fragrance oil in the soaps is enough to give it a beautiful fragrance! Organic Soap Base: Mirah Belle's Soap Bases are completely organic, and are handmade with love. No artificial color or chemicals are used in making the base. Only natural ingredients like goat milk, vegetable oil, Glycerin, shea butter, olive/palm/coconut oil, Lye, are used to build the soap base. All these ingredients contribute towards making the skin soft and keeps it moisturized and well-hydrated.